The main OTC FX platforms have now reported their May 2014 volumes. EBS had a good May, with a 7.3% rebound in volumes following the steep -22.3% decline in April – would be interesting to see whether the increase was from the main EBS Markets, or their new disclosed relationship offering EBSDirect as discussed in previous post. FXall however, saw a modest -4% drop in May following an almost unchanged April. By contrast, Reuters matching continued the January decline, with a -3.3% drop in May following an -18.2% drop in April and bringing the year to date decline to some -25.6%. 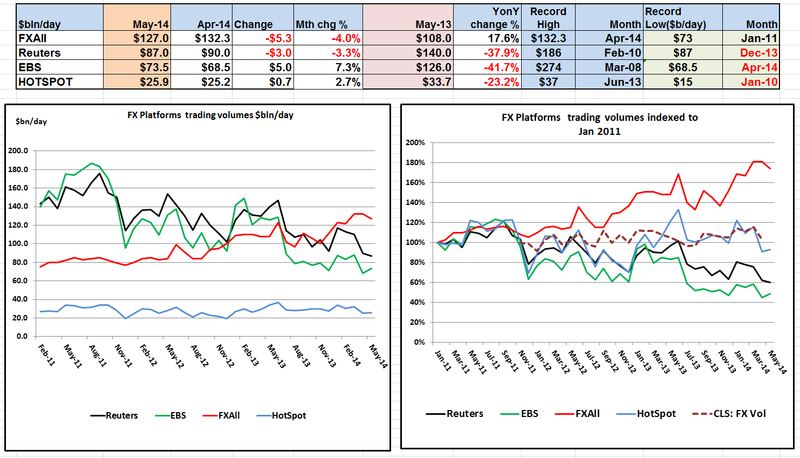 FXall: $127bln/day in May, -4% on the $132.3bln/day in Apr, but still 17.6% up compared to May 2013 level of $108bln/day. Reuters Matching: $87bln/day in May, -3.3% on the $90ln/day in Apr, and down -37.9% compared to May 2013 level of $140bln/day. EBS: $73.5bln/day in May, up 7.3% on the $68.5bln/day in Apr 2014, although still down -41.7% compared to May 2013 level of $126bln/day. Hotspot: $25.9bln/day in May, up 2.7% on the $25.2bln/day in Apr 2014, although still down -23.2% compared to May 2013 level of $33.7bln/day. Left chart is actual volumes, and right chart is indexed based at Jan 2011.
what about Bloomberg? Aren’t they a big player in the FX market?